An easy vegetable chop suey recipe featuring jicama and black beans. This flavourful dish comes together quickly and the sauce can be made in advance. Black beans make a good alternative to tofu or tempeh for a soy-free meal. 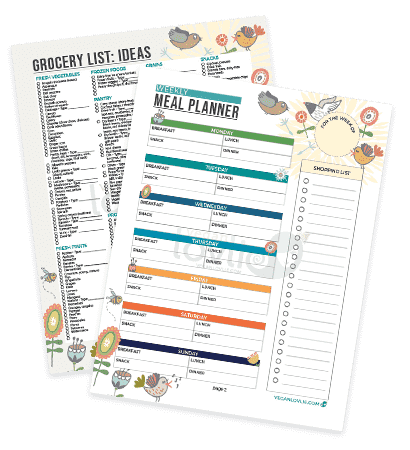 One of the many things I am grateful about for having lived in a few different countries is the exciting discovery of new food items — vegetables, fruits, grains, beans, legumes — characteristic to or available in the area. But sometimes what is more fascinating is when you come across a foodstuff that you grew up with and never thought you’d see on the other side of the globe. Sure enough there are the common eatables out there that are basic staples everywhere but I am talking about the more local kind of foodstuffs. The kind that you think would mostly be available in certain areas only. Last week, I happened to be pleasantly surprised to fall on some majestic looking jicamas! I really had to gasp with half excitement and half surprise. I had never before seen jicama here and quite coincidentally, one of our viewers on Youtube had recently requested a recipe with jicama. I wasn’t sure I was going to find jicama in Montreal and I thought I’d probably have to make the trip to the Asian store but I found some in a Loblaws store close to my place. Woot! Without any second thoughts, I grabbed a few while my mind was already rushing with recipe ideas. 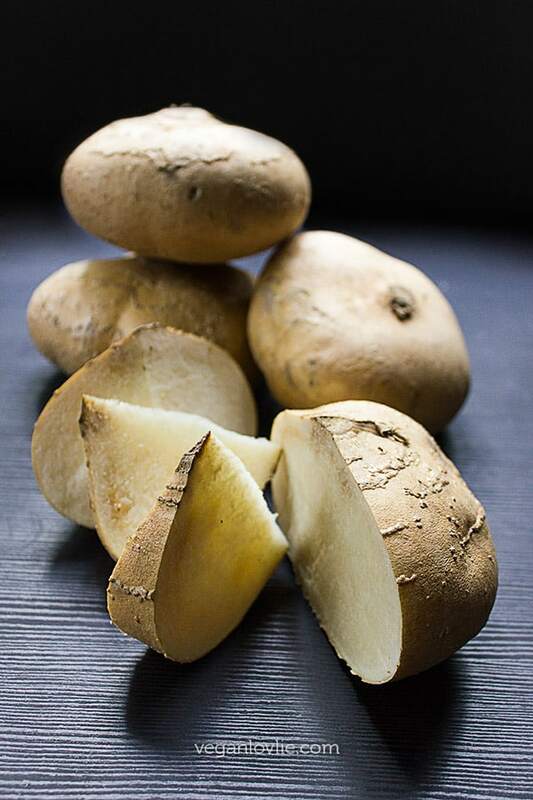 In Mauritius, jicama is more commonly known as the Chinese potato or Chinese yam, ‘patate chinois’ as we locally call it. The most common way that we enjoy it is pickled or just raw with a little salt and crushed chilies. The mere thought of what I consider to be a supreme treat makes my mouth water. If you’ve never had jicamas before, they taste something like a water chestnut, mildly sweet, crunchy, watery and starchy. 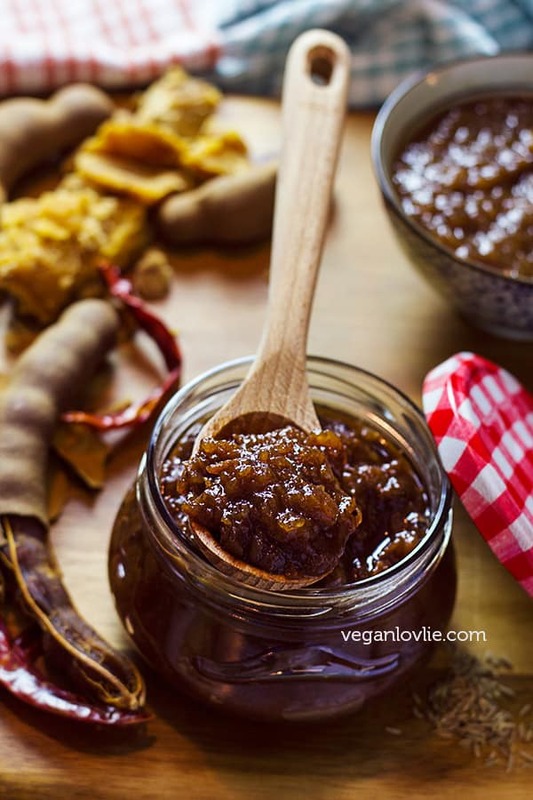 I really cannot contain my elation so I will be sharing the pickle recipe too in another post. Jicama are easy to prepare. They can be peeled just like you would peel a potato. Infact, they are even easier. Lift a small section of the skin and pull the skin off. It should come off clean and easily. 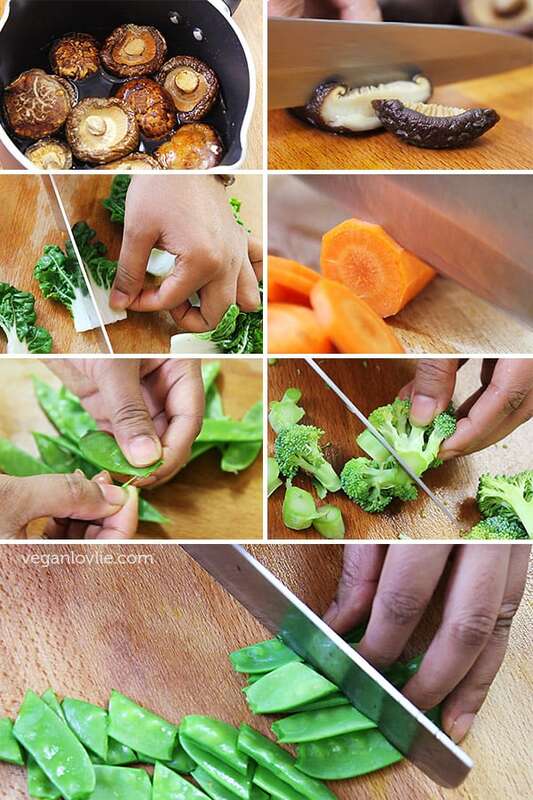 Once peeled, you can cut it into small pieces or however you like. In this recipe — Vegetable Chop Suey — a very common dish in Mauritius, because the jicamas that I got were fairly large, I am only use half. This was a good excuse for me to just munch on the other half, sliced and sprinkled with salt just like I love to eat them! If you can’t find jicama, you can substitute them with water chestnuts or bamboo shoots (or both) in this recipe. As far as the protein in this dish goes, on another day, I would have opted for tempeh or tofu but the addition of black beans instead actually worked pretty well — a nice substitute if you are trying to avoid or reduce soy. 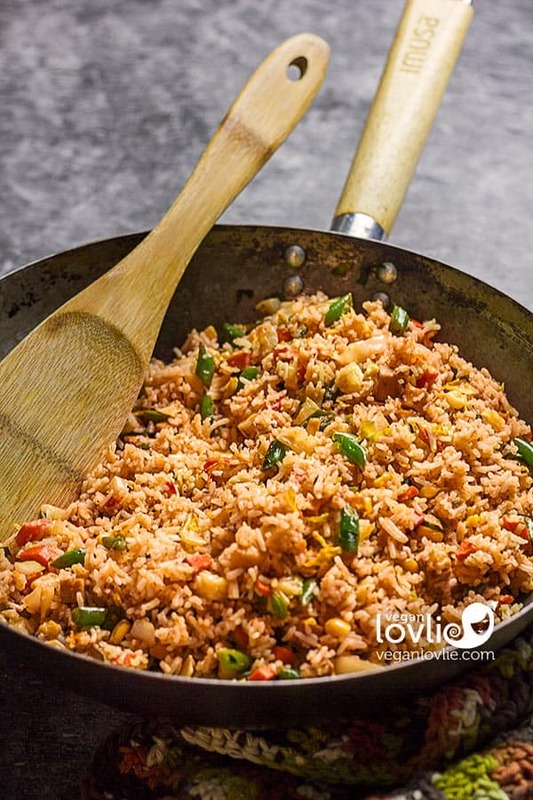 Also I have kept this recipe completely oil-free as I think vegetable chop suey is so packed full of flavour that the oil is not even required. But feel free to use a little oil when sauteing the vegetables if you wish. 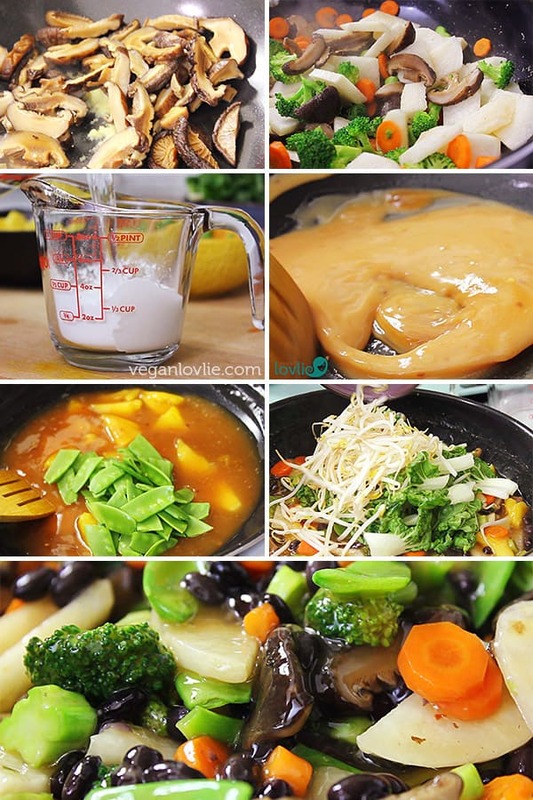 A little suggestion, if you are not serving this vegetable chop suey dish right away, I recommend you keep the sauce and the pre-sauteed vegetables separate until you are ready to serve. That is what I tend to do, for example, if I am having guests. Then, when mixing the sauce with the vegetables in the final stage of cooking, I am also reheating the meal. Otherwise, reheating after everything has been mixed will result in the vegetables being overcooked, losing their taste and bright colour. 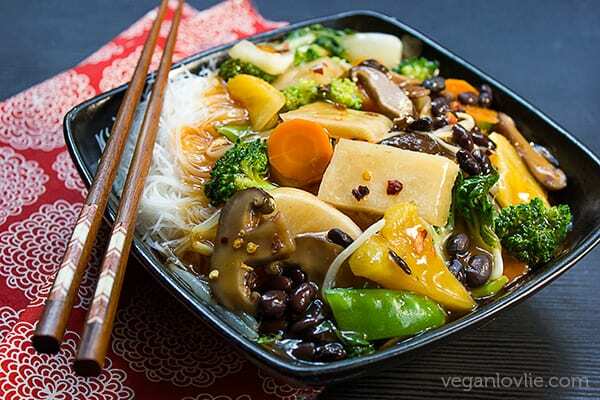 Watch the recipe video for the easy step by step process of how to make Vegetable Chop Suey with Jicama and Black Beans. Start by rehydrating the shiitake mushrooms. In a saucepan, cover the shiitake with some water and simmer on medium temperature for about 10 minutes or until they are soft. You may cover the pan to keep them softer. Once soft, drain the liquid and set aside. While shiitake are simmering, prepare the other ingredients. 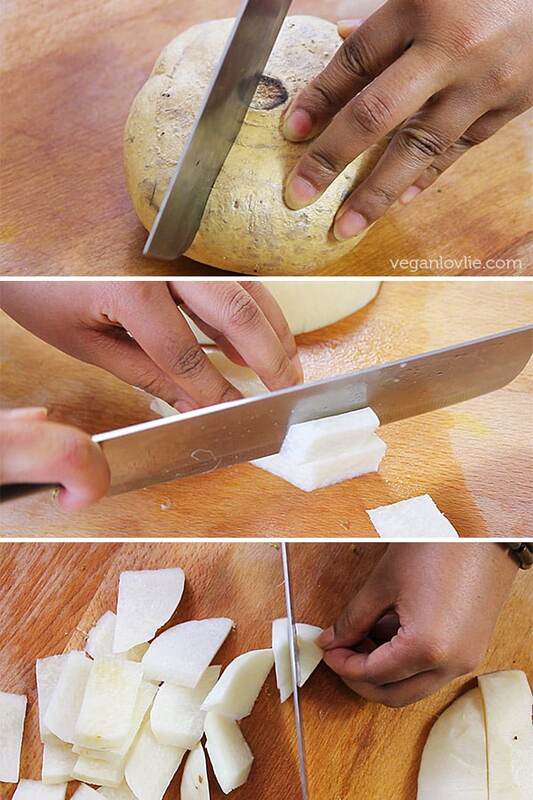 Peel the jicama then cut into small pieces. I cut mine into rectangular slices of about 5 mm or 1/4-inch thick and 2 inches in length. Cut the rest of the vegetables/fruit — carrots, bok choy, broccoli, snow peas, shiitake mushrooms and pineapple. Start to saute the vegetables. In a wok, on medium-high heat, add the minced ginger and garlic (if using). Allow to heat for 1 minute until ginger starts to sizzle. Then add in the shiitake mushrooms. Stir and saute for about 2 minutes, add a little water if required. Add in the carrots and cook while stirring occasionally for another 3 minutes. Add a little water or vegetable broth as required to prevent the vegetables from sticking to the pan. Next add the broccoli, onions (if using) followed by the jicama. Toss and continue to steam-fry for another 2 minutes. We are only partly cooking the vegetables at this stage as they will cook further later on in the sauce. Add the black beans and cook for another minute. Then turn off the heat, remove the vegetables from the pan and set aside. Now make the sauce. In the same wok (with the heat still turned off), add 3 tablespoons ketchup, 2 tablespoons soy sauce, the rice vinegar, maple syrup or sugar and chili flakes. In a small measuring jug, mix the potato starch with 1 cup of water or vegetable broth. Stir well with a fork to completely dilute the starch into the water. Add this solution into the wok. Now turn on the heat to a medium-high and allow the mixture to heat up. Once it starts to thicken, you can lower the heat and continue to stir until it loses the milkiness and becomes translucent. You will need to continuously stir and add a little water if needed as the mixture thickens. Add the pineapple pieces to the sauce and let it simmer while stirring for about 2 minutes. At this point, you can taste the sauce and adjust the seasonings like pepper, salt or more soy sauce. Now add the snow peas to the sauce followed by the precooked vegetables and beans. Stir these into the sauce and add a little water or vegetable broth to add more sauce. Then you can also add more of the potato starch solution (like one more tablespoon diluted in some water) to thicken the sauce to the desired consistency. 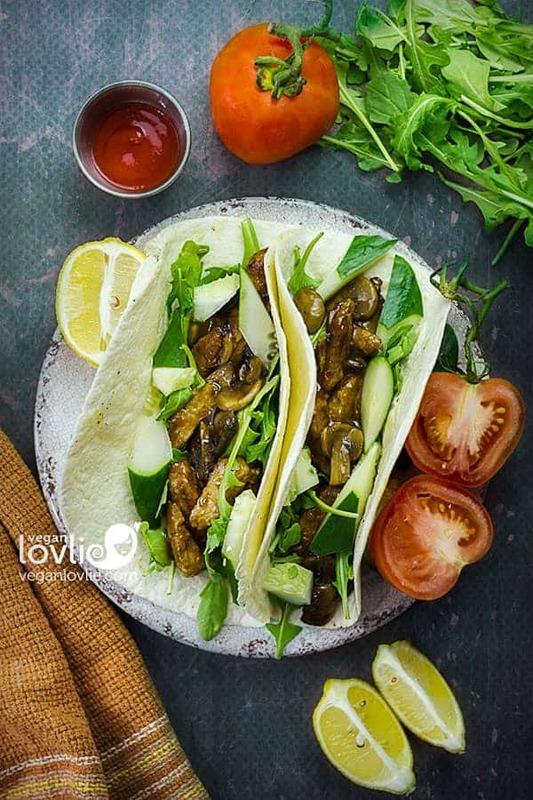 (Never add the powder directly into the sauce as it will instantly clump up with the heat and will be impossible to smoothly blend into the sauce). Lastly add the bok choy and the beansprouts. These don’t require a lot of cooking and you can turn off the heat and allow them to wilt with the heat of the sauce itself. 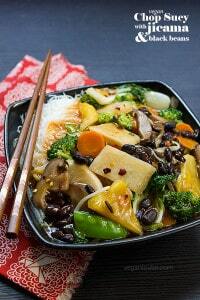 An easy tasty vegetable chop suey recipe with jicama (chinese yam) and black beans. Proceed to preparing and cutting the rest of the vegetables/fruit — carrots, bok choy, broccoli, snow peas, shiitake mushrooms and pineapple. Start to saute the vegetables. In a wok, on medium-high heat, add the minced ginger and garlic (if using). Allow to heat for 1 minute until ginger starts to sizzle. Then add in the shiitake mushrooms. Stir and saute for about 2 minutes, add a little water if required. In a small measuring jug, mix the potato starch with 1 cup of water or vegetable broth. Stir well with a fork to completely dilute the starch into the water. Add this solution into the wok. Now turn on the heat to a medium-high and allow the mixture to heat up. Once it starts to thicken, you can lower the heat and continue to stir until it loses the milkiness and becomes translucent. You will need to continuously stir and add a little water if needed as the mixture thickens. 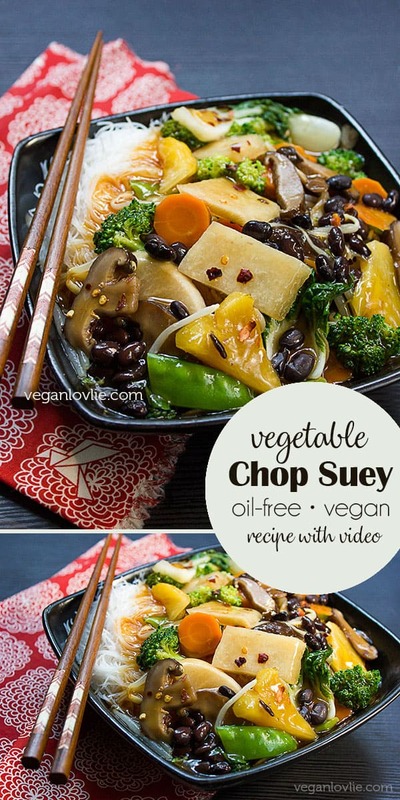 Love this Vegetable Chop Suey recipe? Pin it for later.